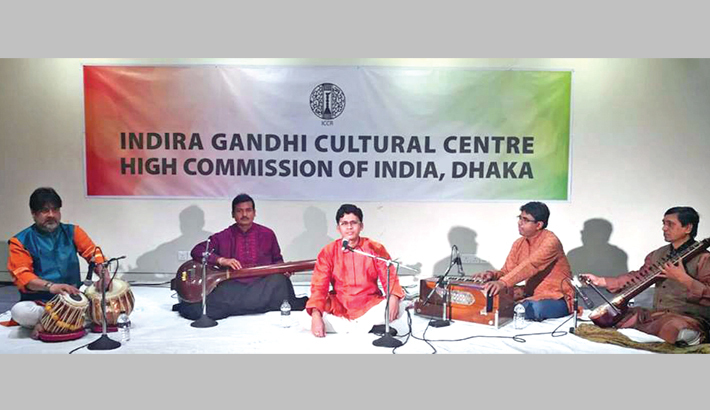 Singer Rabin Chowdhury fascinated the audience with her performance at a Hindustani Classical Vocal Music at Kobi Sufia Kamal Auditorium of Bangladesh National Museum in the capital on Tuesday. Indira Gandhi Cultural Centre (IGCC) organised the Sangeet Evening as their regular cultural programme. Rabin Chowdhury learnt Classical Music at Sur Saptak Sangeet Vidyapit and completed the six year course with First Class. After that he came in contact with Swarnamoy Chakraborty who has been his music guru for ten years. He was also a disciple of Pandit Tushar Dutta of the Kirana and Agra Gharana. At present he is continuing his music studies under Pandit Amiya Ranjan Bandopadhyay, a legendary classical vocalist and pioneer of the Bishnupur Gharana. During his musical career Rabin Chowdhury has come in contact with eminent musicians of India and Bangladesh such as Pandit Nirmalya Dey, Pandit Dilip Das, Dhrupadia Sayeed Nafeesuddin Dagar and Aneesuddin Dagar, Ustad Shahadat Hossain Khan, Ustad Rabiul Islam, Azad Rahman and Pandit Niharranjan Bandopadhyay. Rabin Chowdhury has performed in various classical music conferences. Some of his best performances include Classical Music (Khayal) at the Ramakrishna Mission Institute of Culture, Kolkata, the Behala Marga Music Circle, Kolkata and the India Habitat centre New Delhi.